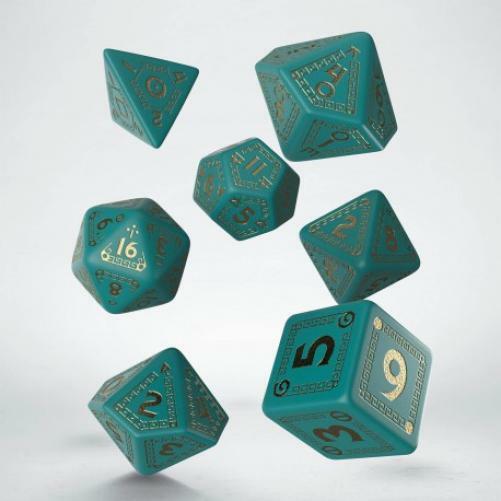 Fill in your details below and we will let you know within 24 hours if we can get 7-Set RuneQuest Turquoise and Gold Dice to you with haste! You have found the dice made specifically for the most acclaimed fantasy setting in the history of RPG, one from the many real game’s treasures. The newest edition of the legendary game from the Chaosium has come. The world of Glorantha and RuneQuest has forty years of history. It was second roleplaying game ever! True story! It's a milestone in RPG, so making a set for this game is quite intimidating. Runequest and Glorantha are the names with capital „N", full of magic, with great stories and with millions of fans around the world It's a great honor to design dice for one of the fundamental games in the history of our hobby. This is, how we in Q WORKSHOP can support Myths. These dice are our tribute to this game. The set we proudly present is made from the best material, full of complex engravings that look like Minoan patterns and signed with plenty of runes. These runes represent many powers from Glorantha, and we hope will give your character access to the magic of the Mythic World, and a chance to become one of Rune Masters. Bronze Age is waiting! Dice for Rune Master – Something New! Runes are building blocks of Glorantha because life is defined fundamentally by runes. These sigils represent the basic cosmic forces that undergird the universe and empower the gods. They control all that surround humans in this world, and beyond, even the death. Humans relate primarily to gods and goddesses, but these deities are themselves aligned with runes. Real Rune Masters can be heralds of runes and gods, fight in their name and die with runes in their hearts. The Turquoise dice with golden ornaments are the real tools for all: the Freshmen, that just started their journey on the path of the runes and Rune Masters alike. This color scheme is similar to the layout of the newest edition of Runequest and symbolizes the new start, new way of daring adventures for veterans and beginners. The Turquoise is the stone for warriors, full of energy and hope for victory. The gold is metal for victors. Both combined are the best talisman for brave adventurers.